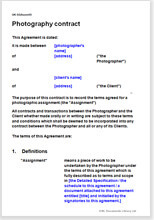 This is a template designed for professional photographers to use to create client contracts on an assignment by assignment basis. We have worked with photographers to produce this agreement. Not only is it legally strong, but also full of practical, commercial options to reflect how you work. These can be edited easily, or deleted, to suit your exact requirement. Our use of plain English has several advantages in this type of contract: not only does it make the template easy to edit, but it also makes the contract less intimidating for your client to sign. Being easy to understand reduces the probability of future disputes. The agreement is in the third person. We think it is useful for your clients to see this as a binding legal document. However, if you prefer a less formal approach, it is still just as binding in law if you edit the text so as to refer to “you” and “I” and so on. As well as covering the situation where you are hired to be the photographer, the contract template can also be used where you take photographs speculatively (for example, at a sports event) and later sell the images. When you buy this template, you buy a licence to reuse it for subsequent assignments. Create master versions for different types of work, or create each new contract from the original template. You can present the contract and ask client to sign as it is, or you can allow a negotiation of terms to shape the final document. Unlike many photography contract templates available on the Internet, we include model release provisions in this agreement, which means you don't have to find this elsewhere as a separate document, then persuade everyone who might be in a photograph to sign it. The most important part of this contract is your retention of ownership of copyright and your licence to your client. We have heard so often about multiple, unauthorised, re-use, for example in estate agents sale particulars. This contract is the best way to protect yourself, your rights, and your income.